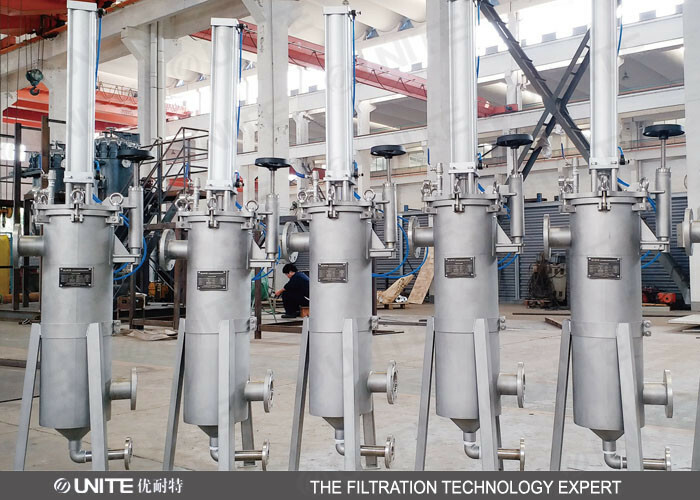 UNITE U-ZC-G1 series cylinder scraper type self-cleaning filter is using mechanical scraping automatically to remove particulate impurities in the surface of the filter element, it can be continuous online filtering. U-ZC-G1 filter is mainly designed for the high viscosity filter, suitable for high viscosity of 800000mPa.s, the precision range can be 50-1500 microns, precision filter, it can quickly filter impurities from scratch element surface to remove impurities, it is more efficient, suitable for water and viscous liquid filtration. The traditional filter often blocks when filtering sticky materials and soft impurities, and user can only use large filters or frequent manual cleaning. The investment of large filter is higher, the work is heavy, and the material waste is serious. U-ZC-G1 filter with advanced self-cleaning design, it is easy to solve this kind of problem, it has regular filter element cleaning process, and discharge waste water containing high concentration of impurities, reduce material waste, the high efficiency advantage of this kind of filter is obvious in filtering water with worse quality, adhesive, resin, polymer, oil and other viscous material. Application: petroleum chemical industry, fine chemical industry, papermaking, food and beverage, water treatment, etc.. Type: suitable for liquid wax, kerosene, monomer, polymer, citric acid, fermentation liquid, chitosan, cosmetics, agarose (gel), silicon resin solution, soap, sorbitol, steroids, syrup, wet end additives, adhesives, paints, lubricants, coatings, resin, latex, ethanol, mixed oil, edible oil high temperature, oil, diesel oil, fruit juice ,etc. [filter process] liquid flows from inlet, pass through the blade, flow from element inner to outerside, and the disc blade with spring stops in the upper location of the element, the impurity is stuck in the inner surface of the element; clean liquid flows out from the outlet. When the impurity increased, the differential pressure would increase, then the filter will start clean process according to setting pressure or time. [cleaning process] When the scraper moves downwards, the impurity is pushed to the bottom of the filter by the scraper, and a large proportion of impurity is precipitated into the sump cavity. When the scraper moves upward, the residual impurity is scraped and pushed to the upper of the filter element, the impurity is washed away by the flowing liquid, and then returns to the inner surface of the filter element through the scraper, and then the impurity is scraped away when the scraper is moving downwards. Each cleaning is composed of several strokes, and the filter surface is clean.The filter is online cleaning, it does not need to shut off the flow rate. [discharge process] After the cleaning process, the impurities are accumulated to a certain amount, open the drain valve to discharge the waste liquid, if necessary, the waste water can be recovered.